Winter Storm Warning for H.C. from Tues eve to Thurs AM. 8-14 inches of snow & gusty winds. Power outages & difficult travel likely Wed.
A Winter Storm Warning is now in effect for Hunterdon County from this evening until early Thursday morning. This will be a long duration event. Conditions on Wednesday may result in travel becoming impossible due to snowfall rates of 2-3 inches per hour. Power outages are likely due to the combination of heavy, wet snow and gusty winds. Visit www.ready.gov for preparedness information. * WHAT...Heavy mixed precipitation expected. 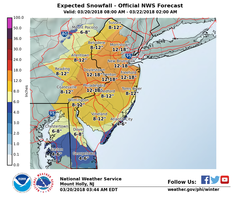 Total snow accumulations of 8 to 14 inches are expected. * WHERE...Portions of northern New Jersey. * WHEN...From 6 PM this evening to 2 AM EDT Thursday. Snow mixed with sleet and perhaps freezing rain at times will develop this afternoon and especially this evening, then change to all snow overnight and continue heavy at times Wednesday. The snow will taper off Wednesday evening. 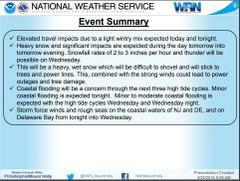 snowfall rates develop as expected Wednesday afternoon. Power outages are possible. Northeast to north winds should gust 20 to 30 mph at times. A Winter Storm Warning means significant amounts of snow, sleet and ice will make travel very hazardous or impossible. The latest road conditions for the state you are calling from can be obtained by calling 5 1 1. Prepare for difficult travel and possible power outages. Visit www.ready.gov for information on preparing your home and vehicle.